Term, the original meaning of which is "order" or "arrangement," frequently used in both Talmuds to denote a section of the Bible read either in the synagogue or in the school. In the statement "Rab read a sidra before Rabbi" (Yoma 87a), Rashi explains "sidra" as meaning a section of the Prophets or the Hagiographa. That the term was applied to the part of the Bible read in the synagogue in the prayer-service is indicated in Yer. Ta'an. i. 64c. But there no special division of the Bible is indicated, while, in Shab. 116b it is said that in Nehardea the people used to read a sidra of the Hagiographa in the Minḥah service of the Sabbath. 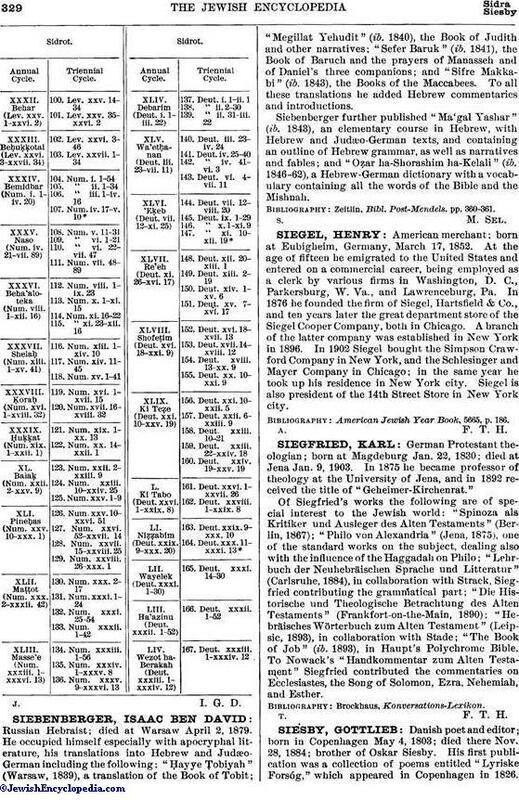 Later the term entered into the usage of the Ashkenazim to denote the weekly lesson of the Pentateuch, just as "parashah" is used by the Sephardim. It may be added that in both Talmuds "sidra" often carries the meaning of "school," particularly a school in which sections of the Bible are read and interpreted (Yer. Ber. iii. 6b; Yer. Beẓah i. 60c et passim). The following is a list of the sidrot (according to the Sephardim, parashiyyot), arranged according to the annual and the triennial cycle. 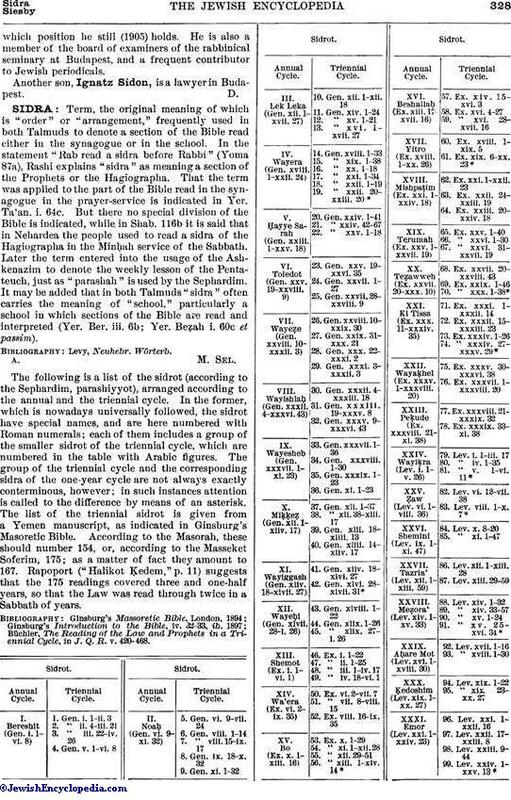 In the former, which is nowadays universally followed, the sidrot have special names, and are here numbered with Roman numerals; each of them includes a group of the smaller sidrot of the triennial cycle, which are numbered in the table with Arabic figures. The group of the triennial cycle and the corresponding sidra of the one-year cycle are not always exactly conterminous, however; in such instances attention is called to the difference by means of an asterisk. The list of the triennial sidrot is given from a Yemen manuscript, as indicated in Ginsburg's Masoretic Bible. According to the Masorah, these should number 154, or, according to the Masseket Soferim, 175; as a matter of fact they amount to 167. Rapoport ("Halikot Ḳedem," p. 11) suggests that the 175 readings covered three and one-half years, so that the Law was read through twice in a Sabbath of years. Büchler. The Reading of the Law and Prophets in a Triennial Cycle, in J. Q. R. v. 420-468.